The Aeroflex 2975 is a flexible, high performance radio test set that has been specifically designed for modern communications applications. This popular RF tester offers many powerful features that make it suitable for a wide range of today’s measurement challenges. It allows professionals to carry out precise spectrum performance testing for transmitters, as well as transmission line and swept antenna measurements. 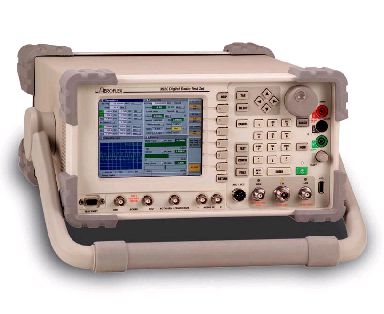 The 2.7GHz analyzer finds numerous applications in various field measurements. Included in its feature set is a digitized spectrum analyzer. It also comes with a digital storage oscilloscope. The dual channel oscilloscope allows professionals to accomplish complex testing exercises without using an external oscilloscope. The Aeroflex 2975 test set integrates the functionality of various precision instruments, enabling users to perform variety of useful tests. The radio test set is specifically designed for RF testing , as well as for troubleshooting. It is ideal for testing exercises that involve both P25 radio systems and AM/FM systems. By simply clicking and tuning, the 2975 allows users to switch to the spectrum analyzer mode. Its duplex operation design allows RF Receive/Generate testing exercises to be carried out with ease. The technician is able to quickly modulate and demodulate FM, AM, and C4FM. Additionally, the 2975 is a quality solution for Frequency, PF Power, Frequency Error, SINAD, Distortion, Voltage and AF level testing exercises. Its frequency markers allow precise measurement and observation of various frequency parameters. This feature specifically enhances testing and analysis of audio signals. The simple to use testing methodology increases productivity, all while offering the advanced technology and capability that Aeroflex is known for. A friendly interface is also featured, allowing for rapid and productive test and measurement. Included is a high resolution, easy to view color display, as well as an external keypad. The model has been designed to enhance the user experience. Its menu structure allows the technician to perform complex testing routines. You can also easily perform automated testing via the provided UUT port. The Aeroflex 2975 test set allows for a wide variety of test options. 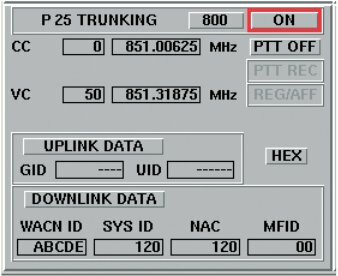 An explicit messaging option that supports messaging for VHF/UHF trunked radio systems is available. The embedded audio analyzer is capable of generating pseudo- random noise. The analyzer can also generate sine functions required for performance testing of audio signals. Another option that is available allows higher security capabilities through the Advanced Encryption System. Professionals can manage its keys using the provided option for Encryption Key Management. For repeater tests that require parametric measurements, the 2975 also has an option for Linear Simulcast Modulation. By making appropriate configurations, the equipment is designed to allow users to carry out tests on trunked radios using the P25 Trunking option. The radio test set is suitable for remote testing and allows professionals to assign it an Internet Protocol address. By taking advantage of its SCCB messaging support, users can effectively simulate control channels for verification of P25 radios operation. Contact us for more information on this or any other Aeroflex models. This entry was posted in Site News and tagged Aeroflex 2975 P25. Bookmark the permalink.